Though immediately dismissed by Viking chief scientist Gerry Soffen as a trick of light and shadow, two computer engineers working at NASA’s Goddard Space Flight Center, Vincent DiPietro and Gregory Molenaar, discovered additional suspiciously misfiled images that some say provide definitive evidence that there is in fact a monolithic face carved on the surface of Mars. 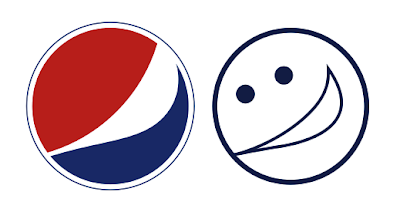 Recently, a document that appeared on the internet - labeled audaciously: “Breathtaking Design Strategy”- attempted to stake the claim that the current Pepsi-Cola corporate identity can trace its upbeat-iconography back well over 5,000 years to the Vastu Shastra - the Hindu tradition of numeric harmony and spatial order. This New Age Powerpoint Presentation further goes on to detail - in a grand Da Vinci Code-meets-the UPC code prose - how every bottle, can and logo ever churned out by the soft-drink manufacturer is both the embodiment and culmination of every form of Sacred Geometry, from the Golden Ratio to the algebraic-influenced figure drawings of Le Corbusier. ...generates its own “symmetrical energy field” that not only creates emotive forces capable of shaping “the gestalt of the brand identity,” but theoretically - and in stark opposition to all the laws of Newtonian Physics, which effectively govern the known universe, mind you - establishes a gravitational pull that causes the consumer experience to shift from a transactional experience to an invitational expression. And drew a bunch of diagrams.